When MMOs go free-to-play, the first question we tend to ask is: are players going to get ripped off? 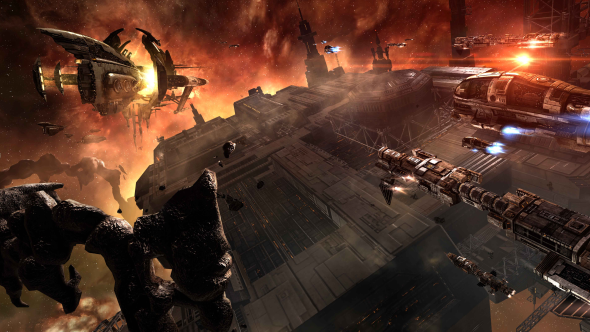 It’s testament to the strangeness of Eve Online that when its non-subscription option was announced last summer, the more pertinent question instead was: how are players going to use it to rip each other off? In Eve’s emergent universe, a population influx had major implications for interstellar politics, recruitment drives, and the role of alt accounts in mining and war. Related: inside (and underneath) the inner-atmosphere combat of Eve: Valkyrie’s game-changing Groundrush mode. 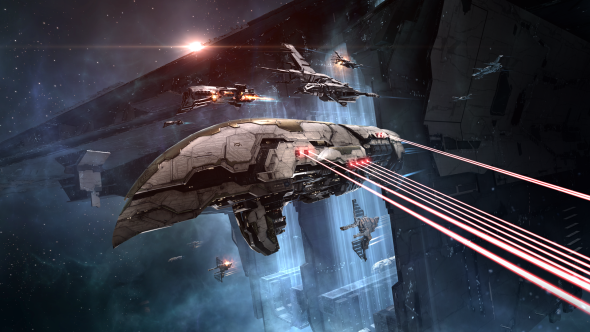 Andie Nordgren, the popular executive producer who has guided CCP Games into the Eve community’s good books since 2014, reflects on the reasons behind the shift four months after the update went live. Further motivation came not from a desire to bring in new players, but to serve veterans who had let their accounts lapse. While Eve is one of the few viable subscription MMOs in modern gaming, that fee has still represented a wall preventing players from coming back to the game. By both developer and player accounts at Eve Fanfest this year, the transition has gone remarkably smoothly. That’s thanks in part to CCP’s strong lines of communication with its community, manifested in the democratically-elected player Council of Stellar Management. It was consultation with players that led the studio to disable multi-boxing with free ‘Alpha Clone’ accounts – that is, logging into more than one character in the client at the same time. “In the beginning we thought, ‘Why should we stop that?’ But Eve players quickly explained what they would do if they had unlimited multi-boxing,” recalls Nordgren. Beneath the threats to “fly 100 Catalysts and gank people” was something CCP were far more worried about: tricks like ‘boosting alts’. These are secondary characters, set up only to offer passive stat increases to a nearby main ship. If that sort of exploit were to become standard practice, new players would have been forced into adopting the same playstyles to stay competitive. What has emerged is the possibility of creating and flying around scores of cheap ships to gather intel, using free accounts as CCTV in systems all around Eve space. This is a guiding design principle for the self-described caretakers of Eve Online. Where other developers see problems in need of nerfing, CCP tend to let things run, only stepping in when the player-driven game doesn’t balance itself out. It’s the approach that’s enabled the culture of nullsec, the NPC-deserted sections of space where the spirit of Eve lives. That culture of efficiently-managed corps, extreme economics, and ingeniously underhanded behaviour hasn’t changed dramatically in the wake of Alpha Clones. But its power players have recognised an opportunity to swell their ranks. This gateway into nullsec play is something Nordgren ponders often. Historically, there have been two Eves – the more traditional PvE MMO you play when you start the game, and then the no-handicaps, self-made sandbox that belongs to players and makes the headlines. Funnelling newcomers from one to the other is still an issue of accessibility that prevents some from ever participating in the stories of backstabbing, betrayal and player-driven warfare that first attracted them to the game. Working to alleviate that problem has led CCP down an incredibly promising avenue for Eve’s future. 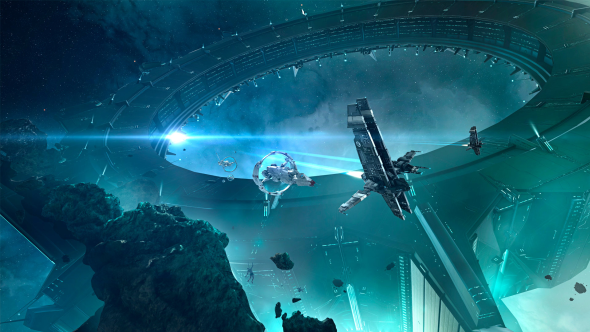 In the past couple of years, the dev team have outlined ideas for ambitious AI that could see NPC patrols emulating the way players operate in Eve – reacting to players based on their faction standing, offering services, defending territory and giving chase. In fact Nordgren sees PvE, an area of the game often considered staid and predictable, as a place where CCP might prepare newcomers for the kind of tactical thinking that will be useful for them out in player-owned space. “What’s going on with this new type of AI is [a desire] to create a new type of PvE that is more interesting in the moment-to-moment gameplay,” she says. Current PvE options like Burner Missions, which pit players against a single, powerful NPC frigate, quickly get figured out, min-maxed and “solved” by the community. The alternatives Nordgren describes wouldn’t be fixed puzzles but emergent scenarios that bear greater resemblance to the PvP game. 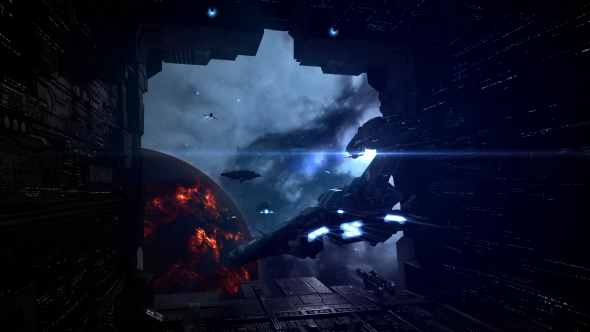 The idea is that new players would soon grasp the concept of strategic positioning – a skill that bleeds naturally into entry-level PvP roles, and scales all the way up to fleet fights, where commanders make educated guesses about ship resistances and match up vessels with targets accordingly. Four months on, free player numbers have settled into figures that are “significantly” higher than before. The ecosystem has benefitted. 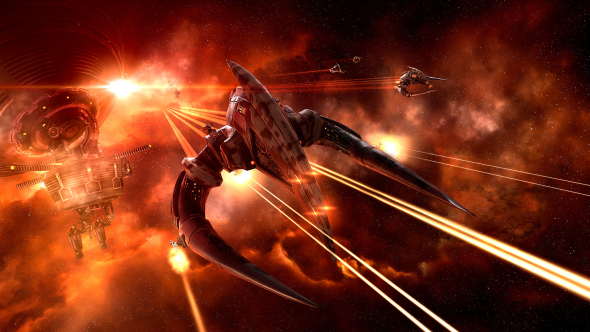 Eve has more new players now than it has in a long time. But now comes the tricky bit. The challenge for CCP’s future is to guide those fledgling pilots to the really good stuff – so that the dramatic stories they’ve heard and read about become part of their personal experience of Eve.